The annual International Living Future unConference is nearly upon us and several from Arch Nexus will be presenting at the 2019 event. The Friday morning session features Arch Nexus Director of Sustainability, Patty Karapinar and Arch Nexus Site Design Leader, Jennifer Styduhar. The annual International Living Future unConference is nearly upon us and several from Arch Nexus will be presenting at the 2019 event. The Friday morning session features Arch Nexus Director of Sustainability, Patty Karapinar and Arch Nexus Site Design Leader, Jennifer Styduhar. Together they will present Abundance through Collaboration: Fostering Community-Based Food Access. Participants in this session will gain perspective from Karapinar and Styduhars’ real-world examples of private-public collaborations utilizing community-driven local food production and Urban Agriculture Imperative scale jumping with a school district. This process increased equity, environmental outcomes, youth education and job skills. Catch Erica McBride and Peter McBride in the Friday afternoon session, Truth or Dare? Let’s Get Honest About Achieving Healthy Indoor Air Quality. Erica McBride is the Building Manager at Arch Nexus SAC. Maintaining a Living Building requires specialized and specific knowledge, passion, patience, and often long hours; demonstrating these day-to-day, Erica advocates for sustainable changes for buildings and how they operate and are maintained. Arch Nexus Associate, Peter McBride is passionate about design and was the Arch Nexus SAC Building Manager during the challenging process of becoming California’s first Living Building. Together Erica and Peter will contribute their knowledge and experience to this “Best Practices” session, taking a strong lessons-learned approach that looks at the final success of achieving indoor air quality results within LBC’s thresholds through a series of failures and discoveries. Enter, Nexus Builds. Joining forces with The Block Project, employees of all levels at Arch Nexus are volunteering, collaborating, designing and constructing a home. Every employee at Arch nexus will have LBC experience by the end of 2019 and Nexus will be the only organization in the world to have designed, owned, operated, and built an LBC project. What’s more, one more person currently experiencing homelessness will have a house by the end of the year. Read the full Trim Tab article here. 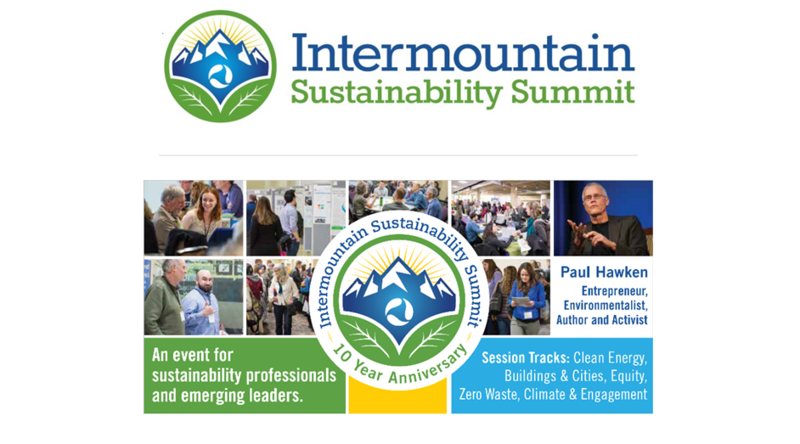 The 10th annual Intermountain Sustainability Summit will be held at Weber State University in Ogden, Utah, March 21 – 22, 2019. Online registration will be available through Tuesday, March 19th and walk up registration will be available onsite. The two day event will conclude with an afternoon workshop presented by Kenner Kingston in the Shepard Union Building room 404. What if every single act of design and construction made the world a better place? Who should attend: Building Owners and Operators, Architects, Construction Managers, Designers, Engineers, Realtors, Students, and those who want to go beyond LEED. An audience member of the SXSW session presented by Arch Nexus’ Kenner Kingston and ILFI’s Amanda Sturgeon, artistically summarized the presentation in this doodle. The session; Nature Tech: Rewilding Human Habitat, discusses restoring each place we encounter to a condition of wholeness. Seeing nature as (free) technology is a key step in restoring our buildings, neighborhoods, communities, and cities to their full potential. Discussions about the water-energy nexus have reignited conversations about energy impacts and consumption. Presenters will use real-world examples to show how unique building and space types have successfully implemented and documented their energy impacts and performance. During this session, we will delve into how LEED addresses energy today through LEED v4 and through pilot credits and also take a look towards how today’s trending topics, like the water-energy nexus impact LEED’s future goals. 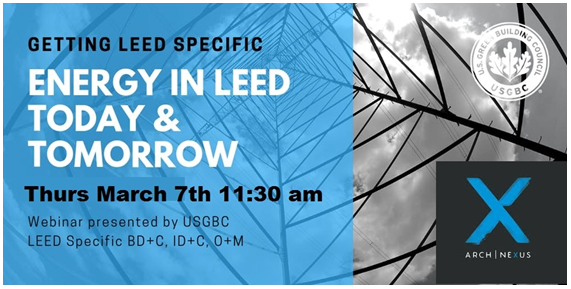 A webinar course approved for 1 LEED specific GBCI CEU that will be hosted in the Architectural Nexus office in SLC. Lunch optional. Discussion and dialogue following the 60 minute course. South by Southwest, the annual conference and festival held in Austin, Texas, will host a session led by Arch Nexus President, Kenner Kingston and International Living Future Institute CEO, Amanda Sturgeon. The March 11th event is titled Nature Tech: Rewilding Human Habitat. 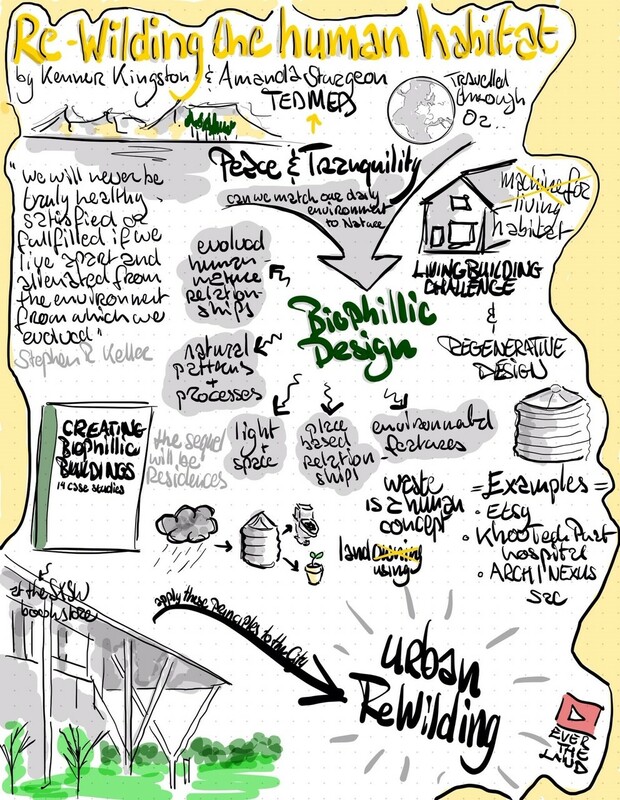 Regenerative Design suggests that we must restore each place we encounter to a condition of wholeness. Seeing nature as free technology is a key step in restoring our buildings, neighborhoods and communities to their full potential. To leverage this technology, a critical shift in philosophy is taking place. The built environment is no longer simply a “machine for living”. Instead, a new notion of shared and intensely local habitat for people is coming into focus; one that is informed by the simple truth that WE ARE NATURE. For more information on this and other 2019 SXSW events, click here. Are you in Chicago attending GreenBuild 2018? Don’t miss tomorrow mornings breakout session, presented by Arch Nexus’ Kenner Kingston and Patty Karapinar: Regenerative Design through Adaptive Reuse. If architecture is the largest energy-consuming and emitting sector of the US economy, architecture is also the solution. Much of our green building industry is focused on new construction on greenfield sites, yet existing buildings within and around cities are ripe for regenerative design opportunities. Through thoughtful adaptive reuse, we are poised to transform our cities and the lives of the people within them. By reinvesting in the building stock we have, we take the most sustainable action of all in that we avoid further consumption of not only building materials, but also open space, clean air, and precious natural resources. 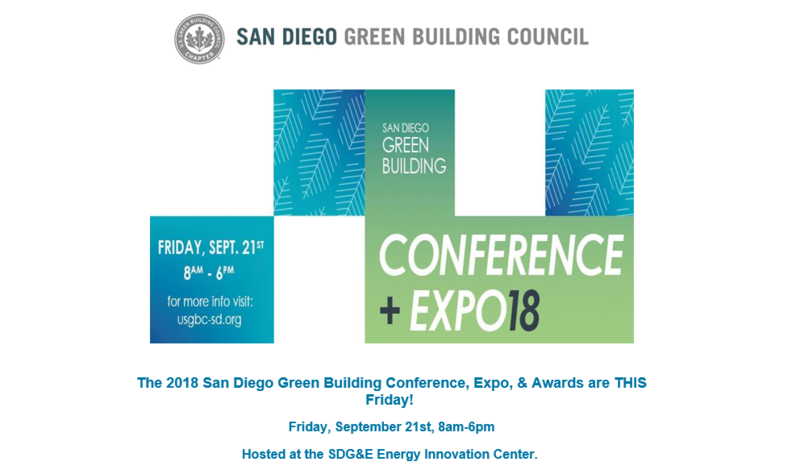 Arch Nexus’ Kenner Kingston and Jeffrey Davis will be presenting at the 2018 San Diego Green Building Conference and Expo. The conference will feature a day-long track dedicated to water, featuring local case studies and successful projects. Kenner will present during all four breakout sessions, Mission Impossible: San Diego Water Capture and Reuse, In the Face of Drought and the concluding session: Mission Possible (part A & B), also presented by experts Jeffrey Davis and others. These sessions will help participants develop an understanding of the obstacles to achieving building water reuse in California and, more specifically, in San Diego. A California Water-reuse map will be presented, demonstrating the regulatory paths to success in this challenging area of practice. They will share how Arch Nexus found ways to eliminate the needs for water to be conveyed to or away from the site. In a collaborative effort with government and local experts, participants will find solutions to both climate and regulatory hurdles that stand in the way of innovative solutions. Arch Nexus is proud to support the first Utah Net-Zero Energy Summit to be held Tuesday, September 18th from 9:00 AM to 5:00 PM at the Salt Lake City Library. In this 1-day summit, guests will have a chance to converse with Special Guest Sam Rashkin (Chief Architect for the US Department of Energy) & other industry leaders about net-zero strategies & tools that offer a competitive advantage for all stakeholders in commercial & residential construction. During the summit, insights of Net-Zero design and construction will be shared to identify the best “bang for the buck” measures and to demonstrate the increasing practicality of Net-Zero Energy design for the built environment. Construction in the 21st centuary: Gearing up for Disruption is organized by Utah’s Net Zero Consortium with The Great Basin Collaborative. Special attendees include: Director of the Governor’s Office of Energy Development, Mayor of Salt Lake City, Mayor of Park City, Chair of the Summit County Council, and Mayor of Moab. On Thursday, June 7th AIA Central Valley presents the Healthy Materials Symposium. The event will feature nine experts through three different sessions, exploring the impacts of materials on human and environmental health, learning of the tools available for prioritizing healthy materials, and identifying strategies for project teams to make informed decisions that promote healthy and sustainable environments. Featured Speaker: Alex Muller is the Manager for the Living Product Challenge (LPC) at the International Living Future Institute (ILFI). The LPC is an international product sustainability framework and certification program, incentivizing the creation of healthy, regenerative products for all. Alex works daily with manufacturers pursuing the program on supply chain issues, material health and life cycle analysis; and with the program’s third party assessors to continually streamline and evolve the program, to scale its adoption. Arch|Nexus Director of Sustainability, Patty Karapinar, will present during session 2: Identifying Tools of the Trade. Patty has thirty years of professional experience, including her recent work on the Arch|Nexus SAC location – the first Living Building in California and the first Living Building that is an adaptive reuse of an existing building. To read more about the symposium or to register, click here.